We have to use our human brains for this one, because the best time to stop counter surfing, and object stealing in general, is before it starts. Reacting after the fact, as you’ll see, can actually make things worse. Dogs explore things with their mouths, much as toddlers do with their hands. So there’s no getting around it: You’re going to have to put your things away, at least initially, if you don’t want your dog to explore and/or eat it. If you can’t put it away, restrict your dog’s access to it—especially unsupervised access—using supervision, redirection, crates, gates, and tethers. And if you absolutely can’t restrict access, you might have some luck with a taste deterrent, such as Bitter Apple or Fooey, which you can spray on items to make them taste bad to (some) dogs. Your management system needs to be in place from the day you bring home a new puppy or dog, because habits will be forming as soon as they walk through the door. Habits are behaviors that have been reinforced enough that the brain decides it might as well put them on autopilot. Once that happens, you’ll have to work harder to persuade your dog that another behavior is a better idea. It only takes a little success for a dog to learn that checking the counter for goodies or picking up your shoe pays off. I wish I could remember who came up with this metaphor so I could give credit, but: Imagine you took out the garbage on your way to work and found a $50 bill in the can. Might you peek in the can on our way to work the next day? And if you found another $50 bill there the next day, I wager you’d check every day for the next month or two—even if you never found another one. And if, a week and a half later, you found another? How strong would the behavior of checking the can become? Dogs don’t care about dollars, but they evolved as scavengers: They are built to find and scarf food. And most of them also love interaction and play with their owners. These are the rewards for counter surfing or object stealing: a delicious tidbit (or a whole pizza, whatever), the attention (finally!) of the owner who’s been on Facebook for the last three hours, and a grand game of chase. In addition to preventing your dog from learning these benefits of object stealing, you’ll want to actively encourage better and, ideally, physically incompatible habits. Here are three ideas. A qualified professional trainer can detail how to teach the simple behaviors mentioned, or others that serve the same purpose, using positive reinforcement. Counter snorkeling: Teach your dog that everything good is on the floor. My friend and fellow trainer Susan Kennedy came up with a term I love: “counter snorkeling.” If your dog never finds anything good on the counter, but there are frequently chews and toys and stuffed Kongs down under, eventually his habit when he approaches a table or counter will be to check the floor. Reinforce laziness: Teach your dog that the fastest and easiest way to get something off a counter and into his mouth is to back up, sit, and stare at it, or at you. Or to go to a mat (see above). I will whip food to my dog directly from the dinner table sometimes—but only if she is on her mat in the corner. Trade up: Be ready to swap for something better, such as a treat or a high-value toy or chew. Try making your dog chase you to get it, rather than chasing him around to trade. Preempt: Teaching a richly rewarded “off” or recall is also helpful for when management fails, so that you can direct your dog to a different behavior as he’s approaching the prize. But the same pitfalls apply: You don’t want to teach the dog that, after hours of lying around quietly, paws up on the counter is a good way to start the fun. So make sure you notice and reinforce all the “doing nothing” your dog does when he’s not surfing. Do nothing. If you see your dog checking a clean counter, wait and watch. If your dog has learned to counter surf to get your attention, don’t oblige. When the dog gives up and walks away, reward that by engaging him in a more productive activity. Punishing stealing behavior is not recommended: It’s likely to teach your dog to steal only when you’re not around, or worse, that he needs to guard the spoils and/or other valued items from you. I’d much rather have a dog who’s willing to trade. Even with training in place, some degree of management may always be necessary—especially if your dog has already developed a big counter-surfing habit. But many dogs learn to move freely through a home filled with shoes, gloves, pillows, children’s toys, Kleenex, and sandwiches without ever thinking of helping themselves. The earlier you start and the more consistent you are with both management and training, the more chance you have of living with one of these dogs. Kiki Yablon, KPA CTP can be reached directly for private or group training via Dog Training by Kiki Yablon. I love this! I have 3 little puppies, so they dont "counter surf" but... they have other issues. For example the shoes! We dont have a mat for the, but its funny how when i am in the kitchen, they all go sit in the corner. I have never figured this one out??? Oh, loving the idea about making the dog chase you for the toy or treat= fabulous! Thanks, Caitlin! If your dogs routinely go sit in the corner, they probably got reinforced for it somehow in the past. You can keep the behavior strong by making sure that still happens once in a while. I am unable to see the kitchen when l am not in there and my dog has learned to be sneaky. If I leave the kitchen he goes in and snatches what ever he can get a hold of. We have tried to make an honest effort to push things to the back of the counter but sometimes that isnt always enough. Do you have any other suggestions? Deperate for a solution. Thank you! My 5 month old puppy is tall enough to be able to get things off the counter. I tried it all! Scolding (which I HATE), luring, “off”, “leave it”, blocking, loud noises, keeping anything on the counter out of reach, everything! I read this and realized that I never tried making the floor more enticing. 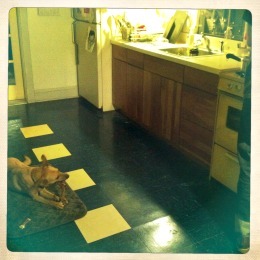 When he would go outside, I started hiding treats/various foods around the perimeter of the kitchen. After a few times of doing that, he’s forgotten about the counters and only canvases the floor! Success!